Don’t you get tired of broadcast media? I unplugged my Comcast cable eight years ago, and I’ve never regretted it. Television programming would interrupt my favorite shows with annoying and idiotic commercials and cancel the few programs I really liked. The worst part is that I had to conform my personal schedule to my favorite program’s schedule. In comparison, social media is perfect. There are no interruptions, and I can visit the networks whenever I have time and the inclination. And it allows me to interact with colleagues and friends across the country and around the world. Most importantly, social media enables me to nurture relationships with readers and friends. Petty cool, huh? Be where your readers are. Curate information in your niche every morning. Select an application and schedule your tweets, posts and updates. Make time to be social every day. Social media is all about nurturing relationships. Did someone retweet one of your messages? Find a tweet they wrote that you like and return the favor. While you’re at it, consider sending a note of thanks to everyone who retweeted you. Is there an agent or editor on LinkedIn with whom you’d like to connect, but can’t because they are a third degree connection? Ask a friend to introduce you. Did a colleague just publish a new book? Help her promote it by informing your friends and connections about it. Socializing on social media involves these three steps: meet, connect, and repeat. You are constantly meeting new people, connecting with them, and then repeating the process with someone new. Remember to be positive and open-minded and stick to neutral topics. 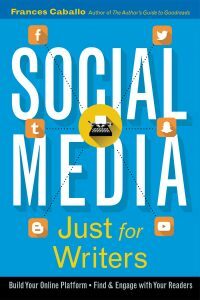 Welcome to the Friday Roundup where you’ll find practical tips for marketing your books on the social web. This week’s segment includes summaries of four blog posts, and of course, your social media marketing tip of the week. This week’s segment includes social media tips you’re going to love, and of course, your tip of the week. Let’s start with my weekly tip. There’s an app that you’ve heard me mention on my podcast and my blog, and that’s SocialOomph. I wouldn’t use any other app to schedule my posts. Here’s why. Once you connect your accounts, scheduling them is super easy. You can select the exact day and time and choose to publish your tweets on multiple Twitter accounts. Welcome to the Friday Roundup where you’ll find practical tips for marketing your books on the social web. This week’s segment of Resources for Indie Authors tackles the topic of marketing your books and blog with images. Keep reading to learn more. If you joined Pinterest in the early days and opened a personal profile, you need to upgrade to a business account. Wait, you’re not a business you say? Of course, you are. You’re in the business of writing and publishing books and if you’re an Indie author that means you’re also forking out some big bucks for editing and design costs. Right? Every Friday I compile a list of online resources for Indie authors to help newly published writers market their books on the social web. I hope you enjoy this week’s selection. Smart Ways to Manage Time on Social Media by Rebekah Radice: Do you struggle to find enough time in your day to manage social media? Does the thought of juggling your social media tasks make you break out in a cold sweat? Let’s face it, business professionals are busier than ever. Between email, phone calls, projects and team meetings, adding social media to the mix is a recipe for overwhelm. The 3 Most Important Factors For Growing Your Social Media Community by Robert Caruso: It seems that almost daily we come across social media marketers, enthusiasts and brands that still seem to have limited understanding of social media best practices. Often the social media “consultant” is even missing key factors in their own social presence that hinders their community, reach and growth. You’d think we would be beyond this in 2014, but sadly that is not the case. The 2014 Social Media Glossary: 154 Essential Definitions by Hootsuite: Welcome to the 2014 edition of the Hootsuite Social Media Glossary. This is a living document that will continue to grow as we add more terms and expand our definitions. If there’s a term you would like to see added, let us know in the comments! How To Get Your Book Into Costco (and other specialty stores) by Penny Sansevieri for The Future of Ink: In order to be considered for national in-store distribution, you need to pass several (many) checks and your book needs to go to their book buyer who is super particular about what she buys for the stores. Understandably. Product needs to move fast in Costco which is why you may see something one week but not the next. Would you love to know the secrets of blogging queens, kings, princes and princesses? You know, those who have hundreds of comments on their blogs and receive thousands of retweets? Well, Denise Wakeman recently interviewed digital marketing expert Rebekah Radice of Imagine Wow whose topic was how to blog like a pro. If you haven’t come across Denise Wakeman online yet, you might want to connect with her on Google+ and subscribe to her weekly Hangout called Adventures in Visibility. If you prefer podcasts, you’ll find her on iTunes, Stitcher and SoundCloud as well. Every week, Denise interviews top pros in the field of online marketing. Her program is consistently good, and she has quite a following. Rebekah started blogging in 2004. As she explained, she’d always been a writer and at first blogged for the fun of it. Then she saw what an opportunity blogging provides for marketers. Would you like to know this social media whiz’s secret to great blogging? It’s pretty simple, actually. Develop a habit. Yep, that’s it. Years ago she knew she needed to be consistent in her blogging, and she wanted to cover big-picture topics while also providing the nitty-gritty details. So she committed to posting one, lengthy blog post every week. She doesn’t miss a week either. Whenever she schedules a vacation or travels to a conference, she knows that she has to write those posts in advance. Focus your points and provide as many tips as possible. People love bullets with tips. Create an editorial calendar for the next three months but be open to accommodating new topics. Now let’s turn the question around. What contributes to a blog failing? Not establishing a blog calendar. Rebekah’s number one tool for increasing shares is that she endeavors to build a relationship with her followers. That’s the beauty of social media. Unlike any other method of marketing, blogging and social media enable authors to get to know their readers. When we blast our content, and never ask questions, we relinquish occasions to learn about our audience. Select one typical person in your audience. What does that person need to know? How can you help that individual? What challenges face that person? Michael Hyatt describes his audience clearly. He writes for men of a certain age and a certain income bracket. Rebekah says that once you determine who that person is, it becomes easier to write for that person. Rebekah also mentioned Social Buzz Club and Triberr. Triberr is an app that enables Twitter followers to form groups. The purpose of the groups is to share each other’s content communally. Similarly, Social Buzz is another collaborative network of professionals who blog. Communities form to engage in reciprocal sharing. As you may have noticed, I’ve been creating a lot of my own images for this blog. Listening to Rebekah, I discovered what I’m not doing: being consistent with the colors of my brand and the font. Finally, she encourages people to “niche down.” Not everyone wants what you have to offer and besides, when you don’t define your specific niche you don’t reach anyone because it’s impossible to market to an unruly audience. Every Friday I compile a list of online resources for authors to help newly published writers market their books on the social web. I hope you enjoy this week’s selection. Using Backstories as a Way to Connect with Your Audience, from the Content Marketing Institute blog: Who doesn’t love a good backstory? If you’re hearing the story, it feels like you’re getting information that no one else has. Or, if you’re telling the story, you get to make a connection that can’t be achieved in any other way. Facebook, Twitter, Instagram, Pinterest, Vine: Social Media Marketing Cheat Sheet, from the AllTwitter blog: So you want to use social media to market your brand? Sounds like a smart plan. The top sites collectively have billions of people actively using their platforms each and every day, and many of them come armed with credit cards. How To Choose A #TwitterUsername When Yours Is Taken by Keri Lynn Engle on the Blogging Wizard blog: The new Twitter design now gives you the ability to pin a tweet to the top of your profile. Now any visitor to your Twitter profile page will see the pinned tweet first, and all your other tweets—including newer ones—will be below. In last week’s post, How to Stop Wasting Time, I discussed the importance of focusing your energy and time only on those social media networks where you’ll find your audience. For example, it doesn’t make sense to invest your time in Tumblr if you’re not writing YA or New Adult novels. If you write Romance novels, you need to have a presence on Facebook and Pinterest. Today I’m going to share with you data from the Pew Research Internet Project that further supports my argument. As of January of this year, Pew Research determined that 75% of adults who engage in online activities use social media. Women hold an edge over men in social media and younger generations, especially Millennials, dominate. And it seems as though users with the lowest income and those who make more than $75,000/annually, are more active. Of those adults who use social media, 19% of those adults use Twitter. What’s interesting about this chart is that the income level starts at 79% for those making less than $30,000/year but climbs back to 78% for those earning $75,000/annually or more. As a client who works with chief technology officers told me, she couldn’t connect with that demographic on LinkedIn but she could find them on Twitter. While Facebook remains the shopping mall that everyone likes to visit, Instagram is considered the fastest growing social media network. In the graph below you can see social media’s tremendous of late. Again, the 18-29-year-old users lead the pack by older adults, including those 50 years old and above, are making great gains. Are You Ready for Mobile Networking? If you’re buying Facebook ads that appear on the right column of the news feeds, it’s time to change that habit. Increasingly, the social platform is becoming mobile and everything you do – from your website to your blog to your social alertness – needs to accommodate that transition. Our primary use of social media is to keep up with friends and family members. At least that’s what two-thirds of online adults told Pew Research. About 14%, mostly middle-aged and older adults, said they use it to connect around shared hobbies or interests. So what are we as authors doing on social media? It has to be more than just hawking our books. The reason social media use is climbing isn’t because we rush to Facebook or Twitter to see what Mercedes, Coca-Cola or United Airlines is selling. We go to social media to connect with other people. Those companies who are successful at social media marketing, such as shoe retailer, TOMS, excels at social media because they connect with people. For every pair of shoes that a customer purchases, TOMS donates a pair of shoes to a child in a Third World country. Their mission is clear, and their fans are fanatical about them. TOMS, Mercedes and Coca-Cola may be brands, but they humanize their social media outreach and client experience. They don’t simply preach their mantra to audiences everywhere. Instead, they target their audience using metrics and experiment with messaging that encourages more sales. Authors need to follow their lead. If you write a nonfiction book, your audience should be easily and clearly defined. But what if you write literary fiction, romance, sci-fi or other types of fiction? Find out who your audience is and then meet them on the social media platforms where you will find them. Once you’re there, experiment with your messaging. Here’s what Stephanie Chandler has to say on this topic in her book, Own Your Niche. Wherever she says business, substitute the word with author. Look at who attends your readings, follows you on Twitter or joins your LinkedIn groups. Review studies that track social media affinities by age and other demographics and then focus your time on those networks. For social media not to be time-consuming, it must be targeted.